This episode of the Mindspace Podcast is dedicated to Bell Let’s Talk day, January 30th, 2019. Please share this post on social media (see instructions below) to contribute to mental health initiatives focusing on anti-stigma, care and access, research, and workplace health. In this episode, Dr. Joe talks with professor Sonia Lupien. Sonia is a Full Professor in the Department of Psychiatry at the University of Montreal. She is also the Founder and Director of the Centre for Studies on Human Stress. Sonia is a highly prolific research scientist, with dozens of publications in some of the top journals in her field. In recent years though she has directed some of this ambition to making her scientific discoveries more accessible to the public. For example, she set up a website to explain all of her lab’s findings in accessible language. She published Par Amour du Stress (the english version is called Well Stressed). And she appears regularly on local radio and TV. She also recently released a stress management iPhone app called iS.M.A.R.T., which was funded by Bell Let’s Talk. 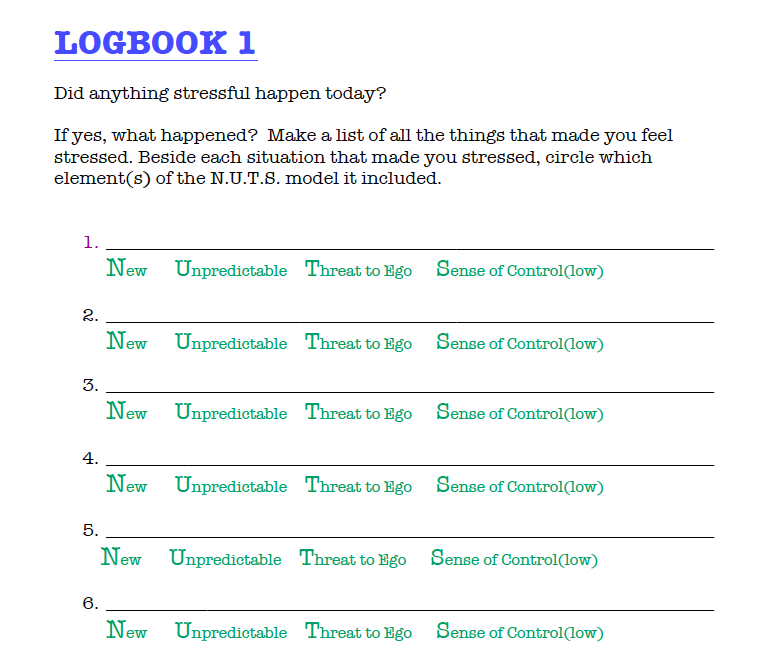 Sonia was generous enough to share with us one of her worksheets from her DeStress for Success program. You can download it here. It’ll come in handy during the podcast. And finally, if you are struggling with stress in any way, please feel free to reach out to Mindspace for information on our therapies, mindfulness trainings, and workplace programs at mindspacewellbeing.com. One of the things that I talk to my clients quite a bit about is the mindset about stress. There was a large epidemiological study in the US with tens of thousands of participants that followed them for many years. One of the significant predictors of early mortality was a belief about stress. That stress is bad. The implication was that if you’re able to view stress in your life that it makes for a positive thing, you’re going to be much more adapted for modern life. Do you buy that? Crum was the first person to talk about stress mindset. He did a study where he split people on the basis of their stress mindset. He took people like this and took them to his lab and measured stress hormones. He found that those with a negative stress mindset had a much more significant level of cortisol than those who had a positive stress mindset. Many scientists asked, why do people have a negative stress mindset? I think there are two reasons for this: one, the media, and two, scientists. If you look at the news, everything is negative. Scientists as well, it’s more popular to study negative stuff than to study positive stuff. The second part of the study of Crum. For a week he presented videos summarizing the positive effects of stress to people who had a negative stress mindset. And he was able to decrease stress hormones in these people. In contrast, he presented videos the toxic effects of stress to people who had positive stress mindsets, and he increased stress hormones. What is the best way to shift people’s mindsets about stress? “Social media. Many studies are studying emotional contagion on social media. There was a study where they modified the Facebook newsfeed to present them with more positive news than negative news from the East to the West of the United States. And then for a week, they look at the contagion of the sharing of these posts. They found that when people receive positive news, they are more likely to share positive news and give positive news. In a study we did, we found that when women read negative news, they are significantly more reactive to stress afterwards. We also measured their memory of the negative news 24 hours later, and the women were remembering 30% more of the negative news. The next time you read the newspaper, look at the valence, positive or negative, of what you read. 97 percent of it is negative. Always. So we think that it doesn’t have a negative impact on us because we’re just browsing Facebook or reading the newspaper while drinking a coffee in the morning, it doesn’t have an effect on us. It does have an effect, particularly in women. I don’t know why. What are the determinants of stress? What makes you produce stress hormones? “What are the determinants of stress? I told you when your brain detects a threat, it produces stress hormones and these stress hormones. But the question is, what makes you produce stress hormones? What are the determinants of a stress response? The first distinction that we make is between an absolute and relative stressor. An absolute stressor is a real threat to your survival. We don’t have a lot of absolute stressors these because we’re in a very wealthy, educated, and healthy society. Yet the World Health Organization predicts depression related to chronic stress will be the second cause of invalidity after cardiovascular disorders which are related to stress as well. We have a problem. This is where scientists have discovered that we’re suffering not because we’re surrounded by absolute stressors, but by relative stressors. Scientists have found that there are four characteristics of a situation that will induce this physiological stress response. I challenge your audience to find a stressful situation that cannot be defined by at least one of these characteristics. Each time your brain is exposed to one or more of these four characteristics, you will produce a stress response. Stress. Don’t go NUTS. Can you unpack that a little bit? What does it mean to make sense of a stressor? Now you know why this particular situation was stressful for you. A well defined problem is a problem almost solved. Once you have deconstructed your stressor, you will reconstruct your stressor. You have to give the feeling of control of the situation to your brain because that way you’ll have less stress hormones. This situation was stressful because it was unpredictable. So what can I do to make it more predictable? Find a plan A, a plan B, a plan C, a plan D.
What you have to understand is that 90% of people will never put into action their plan B. I don’t care because study show that when you have a stressor, if you bring to your consciousness your plan B that you had to deal with it, this mere idea will significantly decrease the stress hormones because it gives the sense of control to your brain to stop producing these stress hormones. I said, ‘On the contrary, kids are much better than adults to do what they need to do to reduce their stress response.’ Follow your intuition. I think that the problem we have so far is that everybody is looking outside of them for universal solutions to deal with stress. “How long does an emotion last? Most people think that when they have a negative emotion, it will last forever. Then they start freaking out and ruminating and then it increases the stress hormones. Studies show that the worst emotion you can have lasts a maximum of 48 hours. Sometimes–if you’re not depressed–the best thing to do is to do nothing because it’s the same as pain. Pain is not fun, right? But why does pain exist? Because it tells your brain, take out your hand from the oven. It’s hot. When you burn yourself, what do you do? You cut your hand? No. You wait for it to go away. Why don’t we do this for emotions? For many people when they have a negative emotion, it’s as if they have a hot potato in their hand. They don’t know what to do with it. They have to get rid of it. And exchange it for a positive emotion, and they’re ready to give up the dog, divorce, and sell the house.